A very wet week, where not much work was done. The wiring to the main electricity distribution board (Main DB) is still being finished as I prepare this article. Solar panels arrived and sheltered in the garage. We know that the German produced solar panels are great quality, then on the opposite end of the scale are the panels produced in China – to be fair there are some factories in China that produce decent products, it is just not worth taking a gamble on finding the right one. We opted to go for the South African brand manufactured in Pinetown Durban from Art Solar. Why we chose them was that they were local if we needed to return them, and that local installers would have more experience with these than with other sourced panels if we wanted help installing the panels. 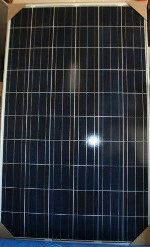 As a comparison, the SolarWorld 255Watt panels were R800 more expensive per panel and we needed 9 units. We chose multi-crystaline (polycrystalline) panels, instead of the slightly better efficient monocrystaline panels, the price difference did not justify the slight improvement in yield. You need to be careful choosing your solar panels to make sure you are within range of your hybrid inverter or charge controller. The same applies here to solar voltages and amperages as it does with the batteries. In parallel, they push up the amps, with a serial connection they push up the voltage. 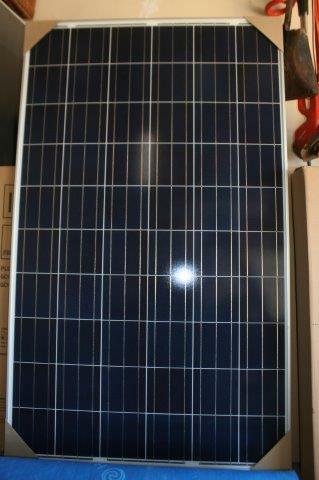 So the RCT 5000 has a charge ceiling of 120Amps and 115Vdc – the solar panels produce 30 Vdc at 8.27 Amps. But the open circuit voltage was 37.6 – so we needed to take that into account as well, not to mention the total wattage of 3000W for the solar array on the RCT 5000. 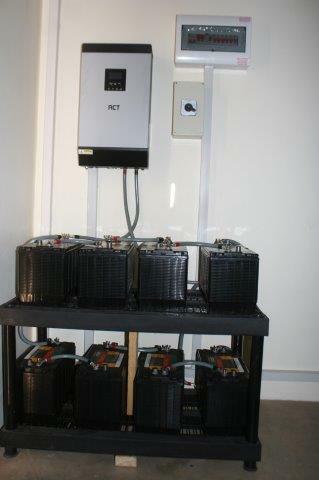 The panels cost us R2100 excluding VAT each. We collected them with a very protected trailer, my advice would be to fetch them is a panel van – the trailer bounced too much, although it did not do any damage, it did force me to drive dangerously slow at times. So what we decided to do was to mount 3 sets of 3 solar panels in series, connect in parallel to each other, that way staying well under the limits of the inverter. Brilliant – by my simple calculations and understanding of limitations and electrical circuits, this should be inside all limits. The next step for the solar side is waiting for good weather and while waiting to decide on which mounting system to use, what cable to opt for and – where and at what angle – to mount this array. What a nightmare! House was built in the early 1960s, wiring that has just been added until every conduit is full, DB board is packed to capacity and poor wiring on top of everything – it really is giving the electrician a good run for his money. In total we are probably going to need 1400W per hour to keep that lot running, or should I say the equipment running that we use at one time. We also have additional plugs that normally don’t get used, to be able to plug something in that is critical – like a kettle if need be. In the garage, next to the RCT 5000, we have installed a new Sub Distribution Board (Sub DB) which will control all of these dedicated circuits. With a little safety added at every corner. I told Themba, our electrician, what I needed and what I thought might work, then he designed it and the safety features until I eventually started nodding saying it was fine, as I had no clue of how the circuit fitted together. I will rely on my simple instructions to Themba and the image in my head of the completed installation, to try and explain it to you. The main feed to this inverter circuit from the Main DB on a 50Amp circuit breaker using 4mm cable connected to an isolator switch (R1300 – my eyes just about popped out of my head! ), this safety feature allows you to reroute the feed directly to the Sub DB in case of an emergency, the opposite side of the switch sends the Eskdom power through to the inverter. The power out of the inverter is then routed back to the Sub DB, but is also sent through a double pole circuit breaker, so that when you work on the circuits, you don’t get voltage from the inverter being charged by the solar or batteries coming through the lines. The rest of it was just running new wires and connecting them to the new Sub DB, leaving enough space and capacity for lots of growth as we grow the alternative power system. Still to be done is the finishing of the wiring, labeling and installation of the LEDs to indicate grid or alternative power and then to get stuck into the solar installation. At least, as load shedding kicked in today, we did not have to run extension cables to the house – life is good!